The prepatellar bursa is a superficial bursa with a thin synovial lining located between the skin and the patella. In cadaveric studies, a trilaminar prepatellar bursa was found in 78-93% of people, and a bilaminar bursa was found in 7-22% cases. Normally, the prepatellar bursa does not communicate with the joint space and contains a minimal amount of fluid; when it becomes inflamed, however, there is a marked increase of fluid within its space. It is clinically very important in prepatellar bursitis to differentiate between chronic nonseptic bursitis (NSB) and acute septic bursitis (SB). 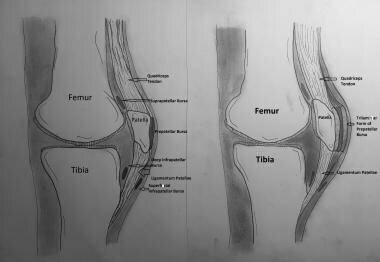 Prepatellar bursa in normal (left) and inflamed (right) state; trilaminar form. Laboratory studies are not usually indicated to diagnose prepatellar bursitis. However, aspiration of prepatellar bursa fluid may be indicated to differentiate NSB from SB. Evaluate the aspirated fluid for white blood cell (WBC) count, protein, lactate, glucose, crystals, and Gram stain results. Plain radiographs may show soft tissue swelling; however, radiographs are necessary only if other conditions are suggested (eg, fracture and/or dislocation). Computed tomography (CT) scanning and magnetic resonance imaging (MRI) are reserved for cases that have been difficult to manage (eg, failure of initial treatment for septic prepatellar bursitis). [5, 6] Ultrasonography may be a useful technique for evaluating synovial fluid in the knee. After the initial period of rest, the goal of physical therapy is to regain any loss of range of motion (ROM) while increasing the flexibility of the quadriceps and hamstrings. Use of therapeutic modalities can be helpful to assist stretching in this period. The role of the occupational therapist in this scenario is to address modifications of activities in patients diagnosed with prepatellar bursitis secondary to overuse. Emphasize patient education, avoidance of kneeling, and use of kneepads if kneeling is necessary. The prepatellar bursa is a flat, round, synovial-lined structure; its main function is to separate the patella from the patellar tendon and skin. This bursa is superficial, suggesting that it is undeveloped at birth. Within the first few months to years of life, the bursa arises from direct pressure and friction. It reduces friction between the skin and the patella and allows maximal range of motion (ROM). Up to 50% of all SB cases occur in immunocompromised patients. Other risk factors include chronic rheumatic inflammatory diseases. Hemobursa is a rare cause of acute prepatellar bursitis, except in cases of trauma or anticoagulation. Prepatellar bursitis is the second most common superficial bursitis after olecranon bursitis. Mortality associated with prepatellar bursitis is rare. Morbidity usually is secondary to pain and limited function. In the case of septic prepatellar bursitis, failure to diagnose in a timely manner may lead to increased morbidity secondary to infectious etiology. Prepatellar bursitis is more common in males than females. Prepatellar bursitis can affect all age groups; however, in the pediatric age group, it is likely to be septic and to develop in an immunocompromised host. The prognosis in prepatellar bursitis is generally good with prompt diagnosis and treatment. Aguiar RO, Viegas FC, Fernandez RY, Trudell D, Haghighi P, Resnick D. The prepatellar bursa: cadaveric investigation of regional anatomy with MRI after sonographically guided bursography. AJR Am J Roentgenol. 2007 Apr. 188 (4):W355-8. [Medline]. SHARRARD WJ. Haemobursa in kneeling miners. Proc R Soc Med. 1961 Dec. 54:1103-4. [Medline]. Myllymaki T, Tikkakoski T, Typpo T, Kivimaki J, Suramo I. Carpet-layer's knee. An ultrasonographic study. Acta Radiol. 1993 Sep. 34 (5):496-9. [Medline]. Richard W Martyn. Treatment of "Housemaid's Knee". Br Med J. 1861 Nov 23. 2:565. Ciaschini M, Sundaram M. Radiologic case study. Prepatellar Morel-Lavallée lesion. Orthopedics. 2008 Jul. 31(7):626, 719-721. [Medline]. Borrero CG, Maxwell N, Kavanagh E. MRI findings of prepatellar Morel-Lavallée effusions. Skeletal Radiol. 2008 May. 37(5):451-5. [Medline]. Wilson-MacDonald J. Management and outcome of infective prepatellar bursitis. Postgrad Med J. 1987 Oct. 63 (744):851-3. [Medline]. Gendernalik JD, Sechriest VF 2nd. Prepatellar septic bursitis: a case report of skin necrosis associated with open bursectomy. Mil Med. 2009 Jun. 174(6):666-9. [Medline]. Huang YC, Yeh WL. Endoscopic treatment of prepatellar bursitis. Int Orthop. 2011 Mar. 35(3):355-8. [Medline]. [Full Text]. Diering N, Klinger HM, Schon MP, Mossner R. Calcific prepatellar bursitis in a patient with limited cutaneous systemic sclerosis. J Dtsch Dermatol Ges. 2017 Dec. 15 (12):1248-50. [Medline]. Khodaee M. Common Superficial Bursitis. Am Fam Physician. 2017 Feb 15. 95 (4):224-31. [Medline]. [Full Text]. Aaron DL, Patel A, Kayiaros S, Calfee R. Four common types of bursitis: diagnosis and management. J Am Acad Orthop Surg. 2011 Jun. 19 (6):359-67. [Medline]. Cariello PF, Wickes BL, Sutton DA, Castlebury LA, Levitz SM, Finberg RW, et al. Phomopsis bougainvilleicola prepatellar bursitis in a renal transplant recipient. J Clin Microbiol. 2013 Feb. 51 (2):692-5. [Medline]. Almajid FM. A Rare Form of Brucella Bursitis with Negative Serology: A Case Report and Literature Review. Case Rep Infect Dis. 2017. 2017:9802532. [Medline]. Wallach JC, Delpino MV, Scian R, Deodato B, Fossati CA, Baldi PC. Prepatellar bursitis due to Brucella abortus: case report and analysis of the local immune response. J Med Microbiol. 2010 Dec. 59 (Pt 12):1514-8. [Medline]. Traboulsi R, Uthman I, Kanj SS. Prepatellar Brucella melitensis bursitis: case report and literature review. Clin Rheumatol. 2007 Nov. 26 (11):1941-2. [Medline]. MacLean S, Kulkarni S. Tuberculosis of the patella masquerading as prepatellar bursitis. Ann R Coll Surg Engl. 2013 Jan. 95 (1):e17-9. [Medline]. Tuff T, Chrobak K. Septic olecranon and prepatellar bursitis in hockey players: a report of three cases. J Can Chiropr Assoc. 2016 Dec. 60 (4):305-10. [Medline]. [Full Text]. Krishna R, Rathod A, Preetham. Massive pre-patellar bursitis – a case report. Indian J Orthop Surg. 2015 Apr-Jun. 2(2):124-6. [Full Text]. Northam MC, Gaskin CM. Presumed prepatellar fibrosis in collegiate wrestlers: imaging findings and clinical correlation. Skeletal Radiol. 2015 Feb. 44 (2):271-7. [Medline]. Baumbach SF, Lobo CM, Badyine I, et al. Prepatellar and olecranon bursitis: literature review and development of a treatment algorithm. Arch Orthop Trauma Surg. 2014 Mar. 134(3):359-70. [Medline]. von Dach E, Uckay I, Agostinho A, et al. One- versus two-stage bursectomy for septic olecranon and pre-patellar bursitis: a prospective randomized study. American Society for Microbiology. Available at http://www.asm.org/index.php/asm-newsroom/journal-tip-sheets/371-news-room/icaac-releases/93720-one-versus-two-stage-bursectomy-for-septic-olecranon-and-pre-patellar-bursitis-a-prospective-randomized-study. Sep 18, 2015; Accessed: Oct 20, 2015. Uckay I, von Dach E, Perez C, et al. One- vs 2-Stage Bursectomy for Septic Olecranon and Prepatellar Bursitis: A Prospective Randomized Trial. Mayo Clin Proc. 2017 Jul. 92 (7):1061-9. [Medline]. [Guideline] Liu C, Bayer A, Cosgrove SE, et al. Clinical practice guidelines by the Infectious Diseases Society of America for the treatment of methicillin-resistant Staphylococcus aureus infections in adults and children. Clin Infect Dis. 2011 Feb 1. 52 (3):e18-55. [Medline]. [Full Text]. Martinez-Taboada VM, Cabeza R, Cacho PM, et al. Cloxacillin-based therapy in severe septic bursitis: retrospective study of 82 cases. Joint Bone Spine. 2009 Jul 1. [Medline].